Chief Scientist, Food Agility CRC Ltd.
David is a physicist whose research interests include applied optics and precision agriculture. He has worked in precision agriculture for more than 25 years and has led more than 40 industry-funded R&D projects. David established the University of New England's Precision Agriculture Research Group, and the internationally renowned SMART Farm project. He recently completed a national review of telecommunications challenges and opportunities for Australian agriculture. He is a member of the National Positioning Infrastructure Advisory Board and is an advisor on a number of agricultural sector-specific technical innovation groups and communities of interest. 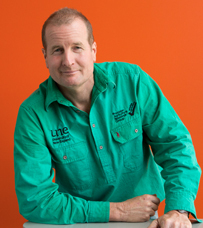 David currently serves as the UNE-hosted, Chief Scientist in Food Agility, a $150M+, 10 year Cooperative Research Centre focussed on transforming the agrifood sector using the power of digital. He is also the Australian representative for the International Society for Precision Agriculture. In 2016 he received the McClymont Distinguished Professorship (Research) at UNE in recognition of his ongoing service to agriculture innovation and research leadership. Alam, M. S., Lamb, D.W. and Rahman, M. M (2018) “A refined method for rapidly determining the relationship between canopy NDVI and the pasture evapotranspiration coefficient”. Computers and Electronics in Agriculture. 147: 12-17. Barwick, J., Lamb, D.W., Dobos, R., Schneider, D., Welch, M. and Trotter, M. (2018) “Predicting lameness in sheep activity using tri-axial acceleration signals”. Animals. 8 (1): 12. Lamb, D.W. (2017) “Telecommunications and Australian agriculture: Will top down meet bottom up?” Australian Farm Policy Journal. FPJ1403E 14 (3): 31-47. Sadgrove, E., Miron, D., Falzon, G. and Lamb, D.W. (2017) “Fast object detection in pastoral landscapes using a Colour Feature Extreme Learning Machine.” Computers and Electronics in Agriculture. 139:204-212. Rahman, M.M. and Lamb, D.W. (2017) “The role of directional LAI in determining the fAPAR-NDVI relationship when using active optical sensors in tall fescue (Festuca arundinacea) pasture”. International Journal of Remote Sensing. 38 (11): 3219-3235. Lamb, D.W., Schneider, D.A. and Stanley, J.N. (2014) Combination active optical and passive thermal infrared sensor for low-level airborne crop sensing. Precision Agriculture. 15:523-531. Falzon, G., Trotter, M.G., Schneider, D. and Lamb, D.W. (2013), Correlating movement patterns of merino sheep to faecal egg counts using global positioning system tracking collars and functional data analysis Small Ruminant Research, 111: 171– 174. Lamb, D.W., Schneider D.A., Trotter, M.G., Schaefer, M.T. and Yule I.J. (2011),Extended-altitude, aerial mapping of crop NDVI using an active optical sensor: A case study using a RaptorTM sensor over Wheat Computers and Electronics in Agriculture, 77: 69-73. Lamb, D.W., Trotter, M.G. and Schneider D.A. (2009), Ultra low-level airborne (ULLA) sensing of crop canopy reflectance: A case study using a CropCircleTM sensor Computers and Electronics in Agriculture, 69: 86-91. Lamb, D.W. (2009) Electrically-heated cables protect vines from frost damage at early flowering. Australian Journal of Grape and Wine Research. 15: 79-84. Lamb D. W. and Hooper A. (2006) A novel laser-optical fiber Bragg grating anemometer for measuring gas flows: Application to measuring the electric wind Applied Optics Letters, 31 1035-1037. Lamb D.W., Mitchell A. and Hyde G. (2005), Vineyard trellising comprising steel posts distorts data from EM soil surveys Australian Journal of Grape and Wine Research, 11: 24-32. Lamb, D.W., Bunganaen, Y., Louis, J., Woolsey, G.A., Oliver, R. and White, G. (2004) FEFA- an optical fibre technique for measuring water colour in turbid samples. Freshwater & Marine Research. 55: 533-543. Lamb D.W., Weedon M.M. and Bramley R.G.V. (2004), Using remote sensing to predict grape phenolics and colour at harvest in a Cabernet Sauvignon vineyard: timing observations against vine phenology and optimising image resolution, Australian Journal of Grape and Wine Research, 10: 46-54. Lamb D.W., Steyn-Ross M., Schaare P., Hanna M., Silvester W. and Steyn-Ross A. (2002) Estimating leaf nitrogen concentration in ryegrass (Lolium spp.) pasture using the chlorophyll red-edge: Theoretical modelling and experimental observations International Journal of Remote Sensing, 23 (18): 3619-3648.